These Indoor LED Signs Mount with Standoffs! Each Two-Panel Systems Features a Quality Acrylic Construction! 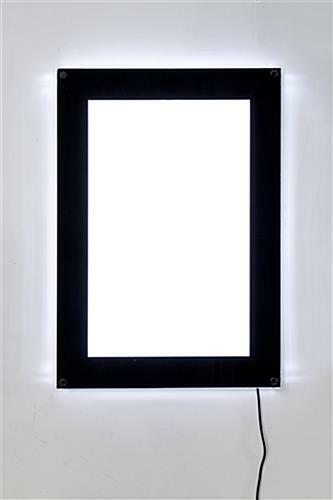 The Indoor LED Signs, called Lightboxes, Sell in Many Sizes and Styles Here! LED lighting is bright and energy efficient. 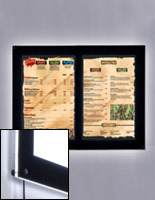 Black standoff hardware and mounting kit for displaying vertically or horizontally. 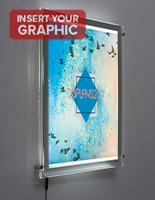 Indoor signs consist of an acrylic backer and clear acrylic overlay, forming a thin light box. 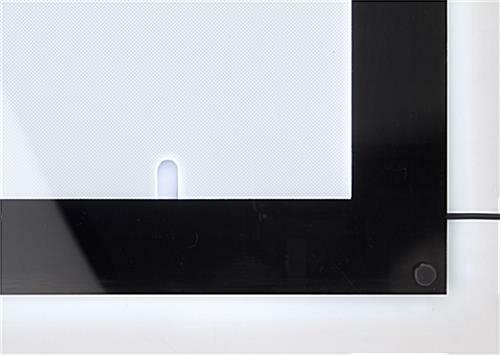 Back panel has a beveled edge, which illuminates to create a glow against the wall. 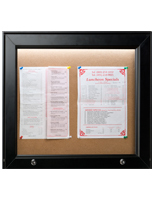 Black frames enhance 11" x 17" translucent posters. Why are so many businesses making the shift to indoor LED signs for advertising? Simple, electronic displays permeate the average point-of-purchase environment, and are a necessity to stay competitive in the struggle to gain foot traffic. These indoor LED signs will not just keep your establishment competitive in the effort to gain new customers. 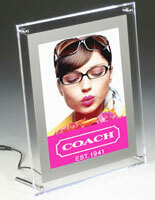 These frames have a cutting-edge design, which will propel any business' advertising campaign to the next level! These indoor LED signs for 11" x 17" posters are essentially two acrylic panels connected with standoff hardware. Signage fits in between the panels. The illuminating frames, indoor LED signs that are acrylic, feature bright lighting emanating from the back panel. A light diffusion pattern disperses the lighting evenly so the poster does not have shadowy areas or hot and cold spots. The beveled edges of the back panel also illuminate, making these displays indoor led signs that have a new-age style. 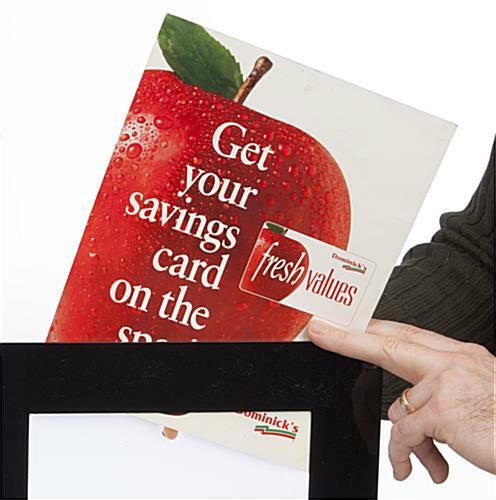 The acrylic overlay panel creates a 2" black border around advertisements. Due to the opaque black border, the edge lighting is actually tempered, and deflected against the wall. This creates a glowing effect that will captivate passersby and draw attention to the poster within the indoor LED signs. Four signage standoff fixtures are included with the unit for mounting to the wall. 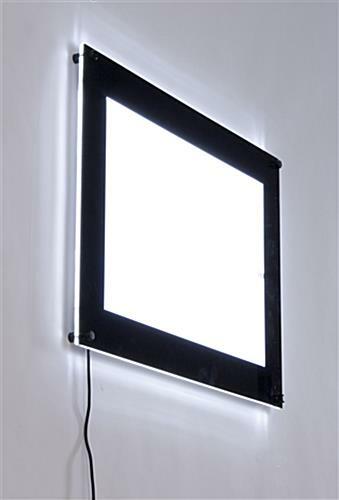 The indoor LED signs that have black standoff hardware come with screws and anchors as well. Users can mount the panels in landscape or portrait orientation. There are finger slots in the back panel to allow users to slide graphics in and out of the unit, without completely dismounting the acrylic overlay. When compared to neon electronic signage, these units save users a significant amount of money in energy costs, due to the light emitting diode bulbs. This increased energy efficiency also results in being more environmentally friendly than many other electronic displays. Please Note: The backlighting is maximized when posters are printed on a translucent material. Overall: 14-1/2"w x 20-1/2"h x 1-1/4"
14.5" x 20.5" x 1.3"